Last winter I tried my first ever brined turkey. It was just as juicy and delicious as everyone said it would be. It was easy to brine the turkey in the winter because during that time of year, my garage turns into a big walk-in cooler. In July, the garage is more like the steam room at a spa (except slightly less glamorous and with fewer people wrapped in towels), so it’s not a good place to store anything while it brines. Instead, I decided to give brining bone-in chicken thighs a try. Much smaller in scale, they can be stored in the refrigerator in a brine solution. Plus, I had a giant family sized pack of bone-in skin-on Gold’n Plump chicken thighs in the freezer. This is important to note because I am super impatient when it comes to thawing. It is a rare day when I think ahead far enough to remove food from the freezer in time to thaw properly in the refrigerator. This time, I removed the chicken in the morning and put it in the fridge. After a few hours, I could break apart the frozen thighs enough so that I could put them into the brine solution. The thighs thawed completely while brining – accomplishing both tasks at the same time. I like food that can multitask, especially when it helps to overcome my short-sighted thawing skills. Making a brine is super easy and it makes the chicken juicy and fully flavored. The chicken can sit in the brine for just a few hours or up to a few days, depending on how good you are at planning and waiting. 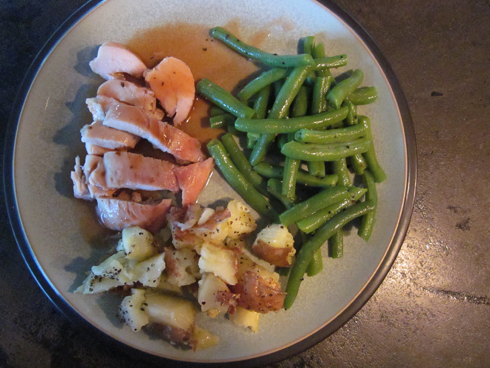 I’m not very good at either, but this is a forgiving recipe and it was delicious even when brined for only 8 hours. In a pot over high heat, combine 2 c. water, kosher salt, brown sugar, and spice rub. Bring to a boil and stir to dissolve salt. Remove from heat, add remaining water and stir. Set aside to cool. When brine mixture has cooled, add chicken, cover, and place in refrigerator for at least 8 hours and up to 3 days. Before grilling, remove chicken from brine, rinse, and pat dry. Grill chicken over direct heat for 7-10 minutes a side, then move to indirect heat for 7-10 minutes until chicken is firm and liquids run clear when pierced with a fork. Remove from heat, cover and let rest for 5-10 minutes. 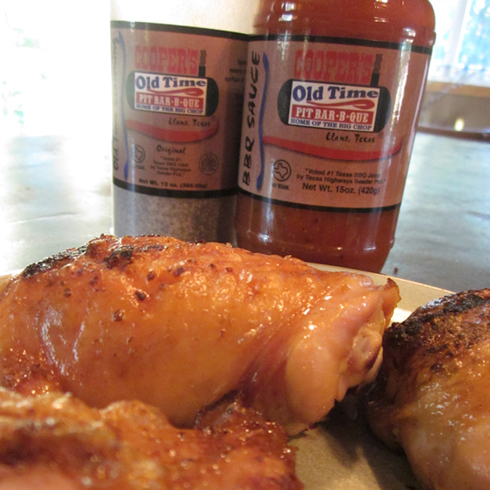 Remove skin, cut from bone, and serve with 2 T. sauce drizzled over the chicken. Coopers BBQ is my favorite place to get good bbq when we’re in the Texas Hill Country. When I’m not there, I make sure I’m fully stocked with Coopers spice rub and sauce. The spice blend is a bit on the peppery side and makes everything it touches well seasoned and tasty. While the rub is good, the sauce is great. It is light, vinegary, and very liquidy. Drizzle some over meat just after you pull it off the grill, use it for dunking, or add it to grilled vegetables for a light dressing. If you don’t have Coopers spice rub or sauce, you could substitute your favorite bbq spice rub and sauce. YOU COULD. But what you should do, is order some. http://www.coopersbbq.com/ Or jump in your car immediately and drive on over. Get there early in the day for the best choice of meats on the pits, then grab a bowl of beans (the only baked beans in the world I like), a glass of tea (sweet or unsweet), and enjoy.